Let’s face it. We all mishit putts—and that includes all the touring professionals making their living at this game. So besides getting the mechanics correct (which also means reading the green properly), a major improvement might be found in using a putter that could help compensate for our errors when the ball is struck even a little off center. After extensive on the course testing, the Cure putter may be that help. When Cure Putters first came out there was a lot of interest because of the variable lie adjustment of the shaft and extremely high MOI (moment of inertia) or resistance to twisting at impact. That second characteristic drew attention because when a Cure hit the ball off center the high MOI stopped the head from twisting as a regular putter does so the ball went more on the intended line. In addition to high MOI the original Cures also were heavy in total weight with well above 500 grams possible if using the optional extra weights. Contrast this with conventional putters of around 350 grams and the difference was very noticeable, and of course a heavier putter tends to smooth out any twitches and quirks we might have in our stroke. This year Cure has new models built with the same idea of heavier weight and very high MOI but with a more traditional look they call the Classic Series and I tested the CX1, a square back blade model. 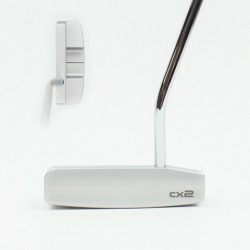 The CX1 has a CNC milled aluminum head, a slightly oversized 5″ blade length and tungsten weights in the heel and toe. Total weight and MOI is adjusted via 6 removable weights in the rear that add up to 42 grams. 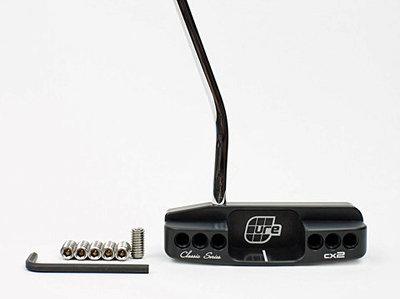 Either black or platinum finishes are available plus there’s a round back design, the CX2. First I removed all the weights reducing the CX1 to 334 grams and producing, according to Cure, a MOI of 6,400. After putting with no weights I then replaced two–one each in the positions closest to the heel and closest to the toe to maintain the heel to toe balance. Repeated the testing and then put four weights and finally back to all six which increase the weight to 376 grams and the MOI to 7,200, again according to Cure. The difference in feel was immediately apparent and after the experiments I settled on putting with all six weights in place. 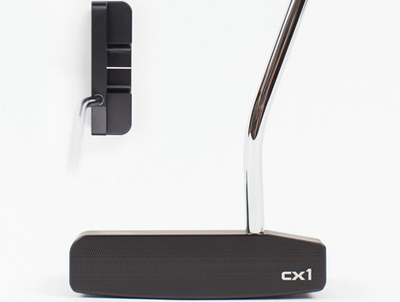 Negatives: Of course you have to like the look of any putter you put in your bag and the CX1 is obviously bigger and looks different than most blade designs so that must be part of the consideration. 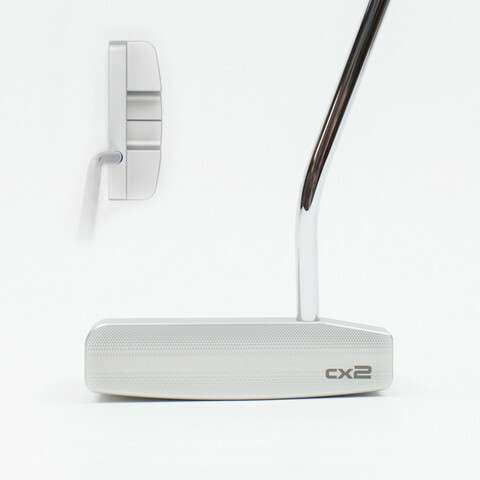 Secondly, the CX1 is so solid you will really have to pay attention on downhill putts so the ball doesn’t wind up way past the hole. Pricing, at $300, is in the upper range. Recommendation: The CX1 is really solid and forgiving so after a very short time there’s a real buildup in confidence in how it performs…put this one on your short list.